BIG APPLE CIRCUS: Bello Is Back! WHO: Big Apple Circus presents "Bello Is Back!" WHEN: 7 p.m. Thursday, Friday, Sept. 29, 30, Oct. 1 and 6; 12:30 and 4:30 p.m. Saturday, Sunday and Oct. 3, 4, 10, 11 and 12; 11 a.m. and 7 p.m. Oct. 2, 7, 8 and 9. WHERE: Palisades Center commuter lot, 1000 Palisades Center Dr., West Nyack, N.Y.; 800-922-3772; bigapplecircus.org. HOW MUCH: $15 to $45. Except for the colorful sign at the gate, you’d never guess that the old copper wire factory in Walden, N.Y., is home to the one-ring Big Apple Circus (BAC), whose season, titled "Bello Is Back!," begins Thursday at the Palisades Center in West Nyack, N.Y.
Forty miles north of the New Jersey border, dozens of clowns and acrobats were spending their days spinning, twisting and joking as the traveling family attraction was making its final preparations for its 32nd season. Dubbed "America’s Best Clown" by Time magazine, Bello Nock has returned to the circus where he made his U.S. debut in 1997. A recent visit to the circus complex revealed the intricate makings behind the scenes. 10:45 a.m.: A practice ring and production facilities are inside, while the big top is pitched outside, along with more than 150 trucks and trailers that are part of the motorcade whenever the circus heads to its next stop. The white tent is home to a single ring and an opera house-like backdrop, which seems to evoke circuses overseas. "In Europe, it’s considered an art form, so they’re performed in buildings, not tents, offering a theatrical intimacy," public relations manager Philip Thurston said. Under the big top, they’re rehearsing the show’s finale and introducing the performers — a few of them with New Jersey roots, including Grandma the Clown from Garwood and Kevin Venardos, the ringmaster, formerly of Montvale. 10:55 a.m.: Circus co-founder Michael Christensen walks through the big top, looking to see if Nock has arrived for the 11 a.m. rehearsal. "Bello’s our thread [for the show]," says Christensen. "He gives us tremendous latitude and freedom in the creation of the show." 11 a.m.: Being a ringmaster "fits like a glove," says Venardos, a Pascack Hills High School graduate who has the natural gait and makings of a ringmaster — tall and svelte, wide smile, broad voice — but never imagined he’d end up in the circus. He studied musical theater at Ithaca College, and "pounded the pavement for a year and a half" in Manhattan before answering an ad for a ringmaster at Ringling Brothers. "I was always looking at New York and wanting to be on Broadway," he said. Instead, he’s "at home in the circus. It’s my job to invite the audience to participate, stomp their feet, get involved, and give [the performers] the respect that’s due," he said. 11:25 a.m.: The orchestra pit has the best view of the Aniskin Troupe, a group of Russian aerialists who flip and jump during their trampoline rehearsal. 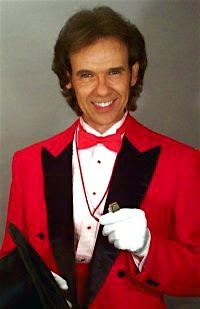 But there are no signs of Bello — "toward the end, Bello gets involved," says Thurston, who suggests we find him. He’s by the practice ring with his daughters, 16-year-old Amariah and 13-year-old Annaliese. Noon: Walden’s Main Street isn’t particularly busy, and Nock fails to turn any heads on the walk to Lillo’s Pizza. He tells the men behind the counter that his mother was Italian and jokes, "My name is Brutto (Italian for ugly), not Bello (beautiful)." It takes Nock a good five minutes before deciding on a stromboli, and he says he’s particularly prone to indecision. "I couldn’t decide which color I wanted to wear today," he said. Indeed, his shirt is half red, half blue. "I’m a shy guy," he continues, tongue-in-cheek. "I’m mellow. I don’t like getting noticed. I don’t like to stick out." That’s also why he grows his bright red hair out at least 10 inches, but no more than 13. His hair-raising secret? "I don’t tell many people this: Kenra hair spray," he said. Performing since age 11, Nock is the seventh generation of a family of entertainers. Annaliese, who is making her professional debut in "Bello Is Back!" — the primary reason for his Big Apple Circus return — becomes the eighth. "I come from a family of daredevils, so I was taught at a young age to do things that were interesting," Nock said, taking a sip of cream soda. "I love making people laugh, but I’m a daredevil at heart, a thrill-seeker." With nary a broken bone, ever, Nock blames ADD for his restlessness. "I’m always saying, if you’re not sitting at the edge of your seat, you’re taking up too much room," he said. 12:50 p.m.: Back at headquarters, in the costume department, racks of clothes from past shows — as well as a massive dry-cleaning rack suspended from the ceiling — take up most of the room, and sketches for the current season are tacked on the left wall. The property is full of interesting locations, including a stable for the circus’s four horses, a cafeteria-style food trailer, and a trailer park the performers call home — complete with fences, satellite dishes and dogs standing guard. 12:55 p.m.: Back in the big top, lights are being tested before a run-through of the second act. With Nock back, they’re ready to work on a trampoline act. Watching from the seats, Annaliese says one reason her father returned to Big Apple Circus was the ability to weave his family into his performance. "It’s hard to perform at Ring-ling because I’m a minor," she said. "Here, it’s a lot easier to get paperwork since we don’t go to so many states," such as California, whose labor laws for child performers are strict. Being around circus performers all her life inspired her to become one herself at age 3. "I was always doing handstands," she said. "My parents joke that I was on my hands more than my feet!" She then spent six years practicing and learning from a member of Ringling’s production staff during her dad’s tenure there. Her acts include high wires, the circle trapeze and the sway pole. Having traveled to most states and around the world, Annaliese mentions how going home to either Sarasota, Fla., or to their beach house in Point Pleasant is vacation for the Nocks. "It’s cool and relaxing to be in one place, but I’d definitely pick the circus life." 2:30 p.m.: After watching the flying trapeze and pingpong acts rehearse, it’s time for Nock and Grandma the Clown to practice their own pingpong act. When it’s over, Grandma — Barry Lubin — stops by. A performer since 1975, the Ventnor native had stints at Ringling and in stand-up comedy but has been with BAC on and off for 17 years. "Every chance I get to speak, I use," he said. "They never hand me a microphone for a very good reason." Lubin’s Grandma character is a Big Apple Circus staple because Lubin has always preferred the one-ring setting. "In an intimate atmosphere, you can really commune [with the audience]," says Lubin. "I have the pleasure of making people laugh for a living. My feeling is, give them a great time, a two-hour escape from their regular lives." Pssst, hey kid! You wanna see what people mean when they say "eccentric dance"? Al Minns & Leon James from the Savoy Ballroom in Harlem on an unidentified live TV show in the 50s. Same video synched to Daft Punk's "Around the World". Did you ever notice that all of these amazingly gifted old-time performers simply exude pure unadulterated joy when they work? They always seem to be in Nirvana. Unlike Nirvana, who always seemed to be miserable when they worked. America's obsession with "cool" really has ruined virtually everything. I know that there are Christians, there are clowns and then there are "Christian Clowns". Does anyone know of Jewish, Muslim, Hindu or any other equivalents to the "Christian Clown"? I don't mean the Trickster character in Native American folklore, or the Buddhist concept of the "Holy Fool". I mean a comparable, contemporary organization. If there are, I can't find any information on them. If not, I wonder why? THE TEGGE CIRCUS ARCHIVES ARE ONLINE!!! 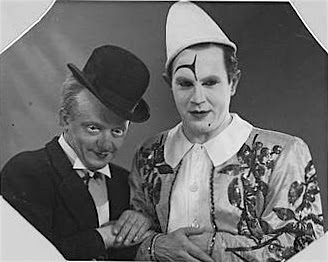 Clown, Ringmaster, Magician, fellow circus and clown historian and friend Tim Tegge has begun making some of his absolutely incredible collection available online. My visit to his home in Baraboo last year had my jaw on the floor: Albert White, Chuck Burnes and Gene Lewis' trunks; Bobby Kay's wigs and costumes; Otto Griebling and Freddie Freeman's boxing gloves... and that's just garage!!! You ain't seen NOTHIN' yet! Take a to visit, enjoy the site and send him a message begging him to start making more of his extensive film and video collection available online! Visit the Tegge Circus Archives by clicking here. BABY NEWS: We have a Date (Theoretically)! Word has come down that Terry can and will be induced on October 1st, barring the idea that Shane is right and the baby comes tomorrow. When asked upon our arrival at Ronald McDonald House when he thought the baby would arrive he answered without hesitation, "He'll be born three days from now." Later, Terry did the math and was amazed to discover that, as of tomorrow, James will have been "in utero" the exact number of days that Shane was. So, James may be here anytime before, but most likely won't be here after, October 1st. This is probably the first time during this entire pregnancy that we've been able to exert some level of control over the situation. It seems like such a small thing but just knowing the "when" of James' birthday will help me to sleep soundly for the first time in forever. Many people have asked if there is anything that they could do to help. Yes, there is something remarkably simple that anyone and everyone could do to help. 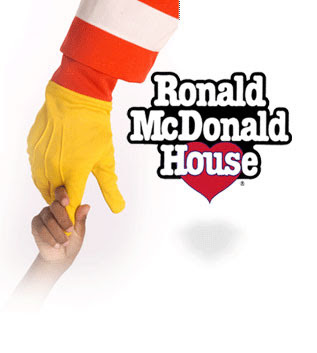 Simply walk into a McDonalds restaurant at some point this week and drop some change into the Ronald McDonald House Charities drop boxes on the counter in front of the registers. You don't have to make a purchase, just support the Ronald McDonald House in your area because they really do make a huge difference for many, many families. I can't always count on Alta Vista's Babelfish software to translate things accurately for me but I believe that it's telling me that this is Anton Francke's performance from the Eighth Moscow International Youth Festival. If anyone can translate the information from YouTube better, please let me know so that I can credit it correctly. Some footage of my old pal, Mr. Benny Schultz.